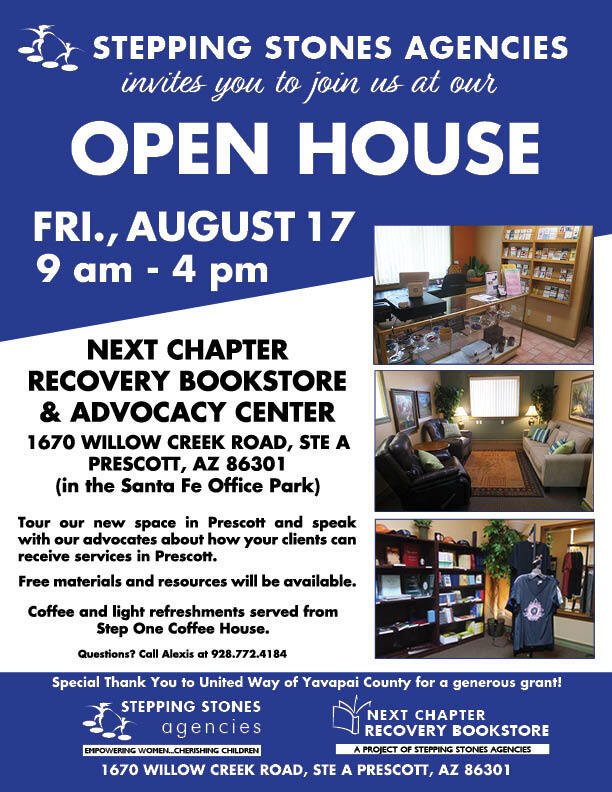 Join us on Friday, August 17 between 9 am – 4 pm for our Open House at Stepping Stones’ new project, Next Chapter Recovery Bookstore and Prescott Advocacy Center, at 1670 Willow Creek Road, Suite A in Prescott (at the intersection of Willow Creek and Rosser). Next Chapter Recovery Bookstore and Advocacy Center is a new space to provide Stepping Stones advocacy services for those who need to talk to an advocate, but may not need safe shelter or have the ability to get to Prescott Valley. Services available at this location include safety planning, lethality assessments, debriefing, educational support groups, and other face-to-face advocacy services. Advocacy services are available by appointment only through the 24/7/365 Helpline 928.445.4673. Additionally, this new location features a 12-Step Recovery and support group bookstore with AA, NA, Al-Anon and other support group books, medallions, cards, and inspirational gifts. For advocacy services in Prescott, Prescott Valley, or throughout the West Yavapai County area, please call our 24/7 Helpline to schedule an appointment: 928.445.4673. Special THANK YOU to United Way of Yavapai County for their generous grant to help make this advocacy services location possible!